“He keeps saying his stomach is burning and doesn't eat. If he doesn't even eat, how will he live? 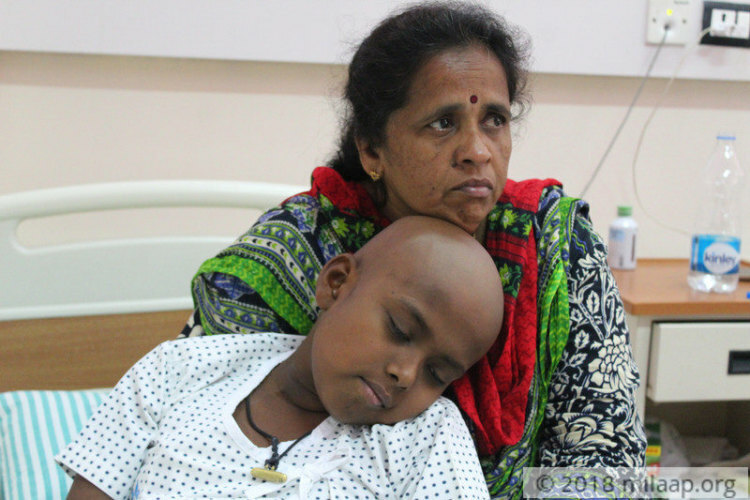 We want him to survive cancer and will do anything so he can get a bone-marrow transplant.” – Munirathnamma, Revanth's mother. 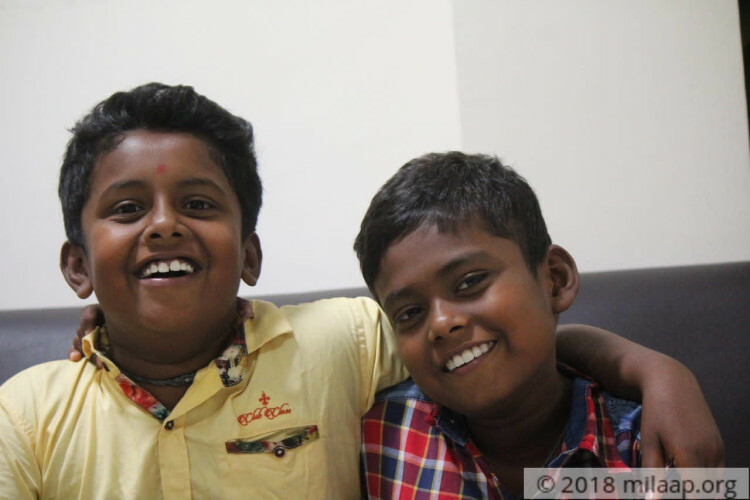 Instead of getting better, Revanth was diagnosed with blood cancer when he came to Bangalore in February 2017. His cancer is aggressive and Revanth lost 10 kgs in just one month. Despite taking heavy chemotherapy, his cancer is not subsiding. 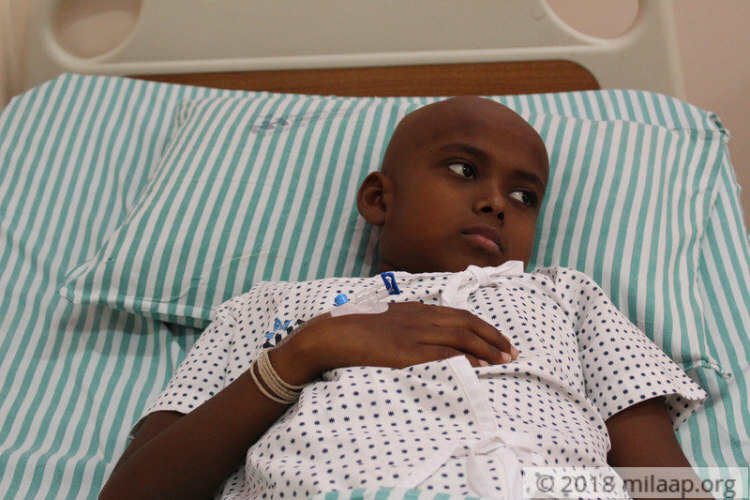 Doctors have recommended a bone-marrow transplant at the earliest – it is the only way to save Revanth now. 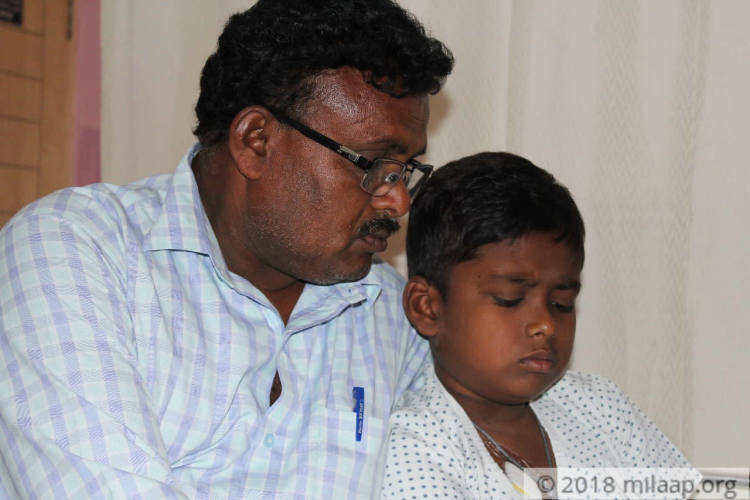 Revanth took treatment for a year and was supposed to start school again in June. To cheer him up, his parents bought him a new school bag. Unfortunately, he had a relapse and that meant they all had to move back to Bangalore for treatment. “Chemotherapy makes his so sick, he can't keep his food down. We have completed only two cycles, and throughout, he complained that his stomach was burning. The day he eats one meal or even a little milk is a good day. 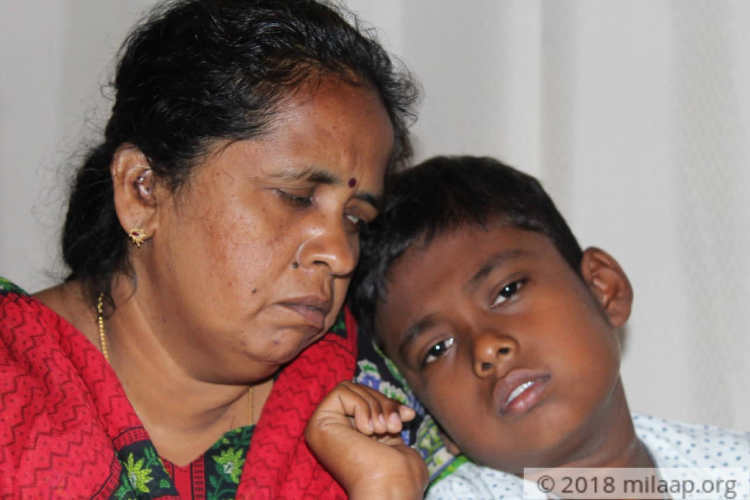 It is painful to force your child when he is sick.” – Munirathnamma. Revanth has a 50% relapse which means that half his new white blood cells are cancerous. A bone marrow transplant (BMT) will mean a completely new bone-marrow that will produce healthy cells. 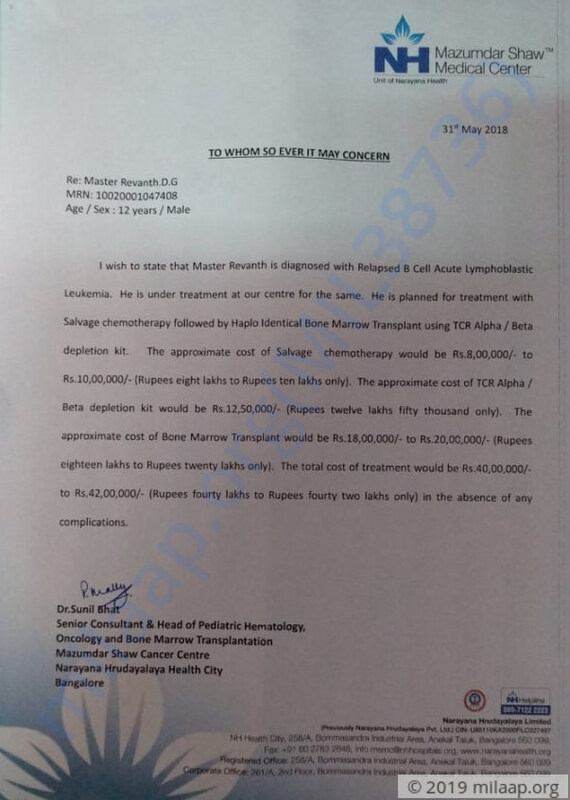 Revanth has very less time and his parents are running from pillar to post to arrange for a lifesaving BMT. Munirathnamma is a typist and her husband Gopal is a teacher in a government school in Kolar. They had decided not to let money decide their child's treatment and borrowed heavily for treatment. With the relapse, they have sunk deeper into debt. They face the prospect of giving up on their child because they have no funds left. Over the last year, Revanth has learnt to bear the pain of needles for medicines and tests. He knows he has cancer and tells his parents not to worry because he is taking all his medicines regularly. He is confident of getting better. It is a confidence, his parents don't share because they have no way of affording a bone-marrow transplant. Your contribution will help these desperate parents save their child. 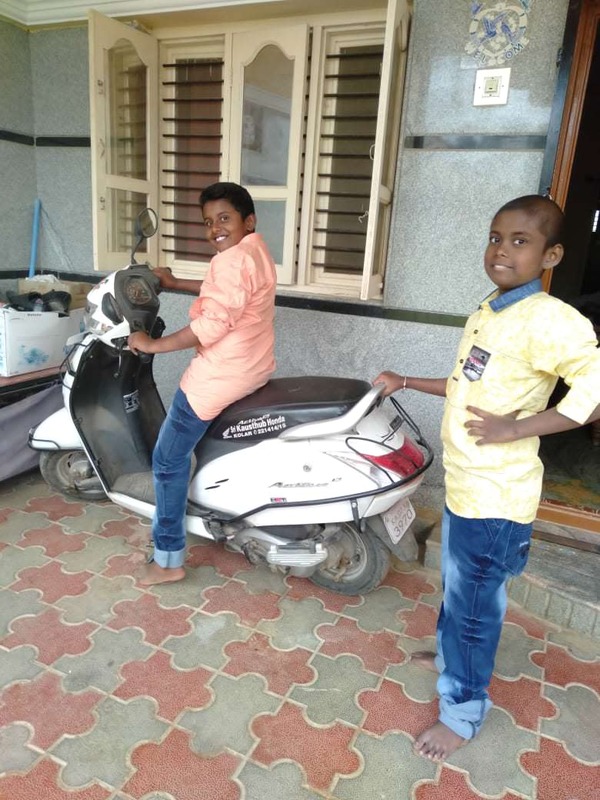 Revanth is doing good and is going to school. He visits hospital for his regular follow ups but has recovered. Revanth is doing well post Bone Marrow Transplant. Revanth is recovering and showing good response for the treatment. Here's an quick update on Revanth. 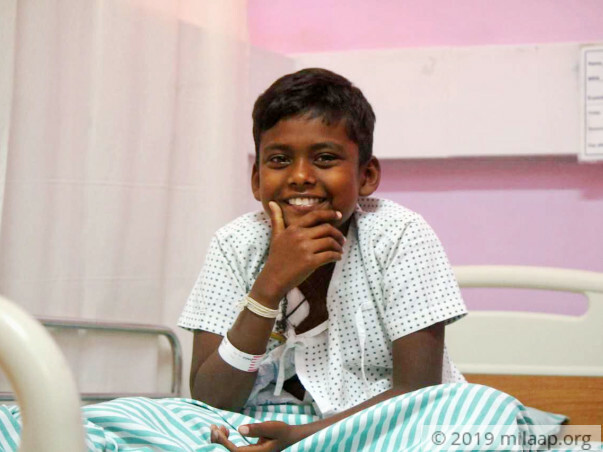 Revanth has successfully undergone his Bone Marrow Transplant. He is doing ok and visits hospital for his regular follow ups.